Whether you’re certain that a master’s or doctorate degree program is in your future or still exploring your options, it’s never too early to start thinking about graduate school. 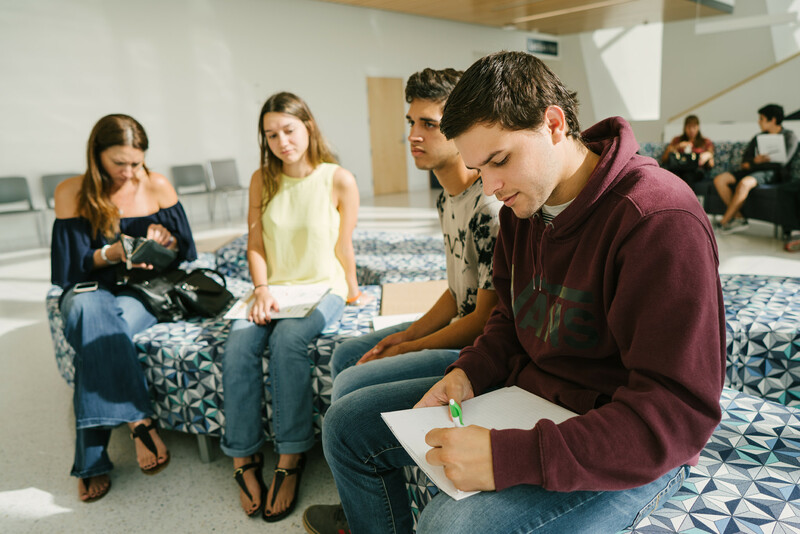 From the moment you step onto campus as a freshman to your final semester before graduation, there are action steps you can take throughout your collegiate journey that will prepare you for graduate school. “Doing the research ahead of time as an undergrad will help you make the right decision,” says Monica Cano, an internships coordinator in the Office of Career and Talent Development. During your freshman and sophomore years, meet with your academic advisor to identify courses that will help you diversify your transcript without taking on excess hours. Choosing minors, certificate programs or electives that will help a build a better foundation will help improve the quality of your academic experience and your transcript. For example, a psychology student who wants to eventually go into a doctorate program that will require a lot of research may want to take additional statistics courses that will help build up their quantitative research skills. “Choosing classes outside of your discipline shows graduate school admissions counselors that you not only enjoy other subjects, but you can also excel in the work,” Cano says. There is no shortage of research and internship opportunities available at or through FIU. And it’s never too early to get involved, even as a freshman or sophomore! In addition to giving you experience that will look great on a college application, you will also learn whether or not your field of interest is actually something you want to get involved in after college. One of the biggest mistakes you can make in college is to walk in and out of class without getting to know your professors. Many of these professors can help connect you with internship and job opportunities and write you a recommendation letter that will be tailored to your skills and attributes. They might even know faculty at the graduate schools you want to apply to and put in a good word for you. So make sure they at least know your name! Your junior or senior year is a great time to start thinking about schools and programs that you feel might be a good fit for you after you complete your bachelor’s degree. Start collecting literature and request information from the graduate schools you’re interested in. Find out which graduate school entrance exam you need to take, how many recommendation letters you’ll need to send in and what deadlines you need to meet. The earlier you know, the better. One of the best ways to get to where you want to go is to talk to people who have been there before. If you are thinking about a graduate program at FIU, ask the program’s advisor to connect you with alumni who have completed the program. Talk to the Alumni Association or the Career and Talent Development team to find alumni who have careers in your field of interest. During your senior year, request a recommendation letter from three to five references. They can be a mix of personal, professional and academic referrals depending on the programs you’re applying for. Before sending them, make sure that each letter is addressed appropriately to each school department. You don’t want to send the wrong letter to the wrong school. That would be awkward. Around the same time, make sure you know what documents you need to submit to the graduate schools you want to apply to. That includes your resume, transcripts, letters of intent and more. The University Graduate School has a helpful checklist that outlines most of items you’ll need to gather for your graduate school applications when you’re ready. More than 15 graduate schools will be on campus on Oct. 25-27 for Grad School Week to speak with prospective students. Click here to find out more.